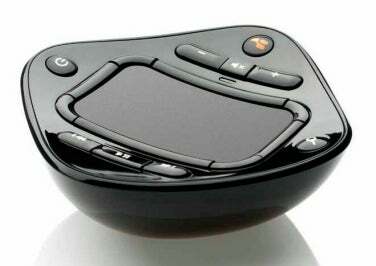 Today, GlideTV releases its $149 GlideTV Navigator, a wireless remote control designed with AV in mind. The fist-sized remote features a clickable touchpad as well as buttons for controlling your Mac’s media applications from the comfort of the couch. While it’s not necessary to connect your Mac to a television, that’s where the Navigator is most at home. Compatible with iTunes, Boxee, Apple’s Front Row, and today’s Web browsers, the Navigator works with the Mac, Windows PCs, Sony PlayStation 3, and any set-top box that supports mouse and keyboard HID devices. It communicates via a receiver plugged into a free USB port. In addition to the receiver, the remote control is bundled with a charging station for powering the Navigator’s battery. On a Windows PC the Navigator can also control an on-screen keyboard and provides integrated search of Google, Amazon Video on Demand, Hulu, Netflix, and YouTube. These features are not supported on the Mac, however.